I am getting a lot of emails telling me that there is something wrong on a nest, or that the birds are gone. When I visit those nests, I find they are incubating, very low in the nest. Sometimes they are very hard to see...I watch for a little movement between the sticks, a little flutter of a feather. Sometimes no head pops up...it's cold and it been raining a lot and they really can hunker down. I also visited some nests I had not been to in about nine days. One nest, that was empty on that last visit, had a pair present that were incubating. I followed the male to a perch and read his band...hmmmm, he was on a totally different nest 9 days ago. He had been seen there several times, copulating with the female. So I go to the nest where I had seen him before...female incubating there also, but I could not find a male anywhere. It started to rain so I will have to return and find the male to ID him. Musical nests. I wonder about the paternity there! I just can't catch up this year, with all the nests, all the bands to read, all the mate swapping and nest swapping. And I have another job too...gotta earn some money to pay for all this gas! I recently read on another website that Ospreys are monogamous and mate for life. This is a commonly held belief about Ospreys and people often ask me about this aspect of osprey behavior. I have documented repeatedly that they are not monogamous and do not necessarily mate for life. A perfect example is our 21 year old male this year. He has been with the same mate for 13 years. This is the longest pair bond I have documented in this population of ospreys. He had at least one other mate prior to this one. However, I have observed this male engaging in many extra pair copulations. He was with another female during the early days of this season before his mate returned. One year I witnessed him copulating with three different females before his long term mate returned! And yet, they remain together year after year. They have been very successful, producing 26 chicks together! This is why they stay together, the biological imperative and driving force is to reproduce. Several of their offspring have returned and nested successfully also. I have also documented many "divorces". I hate this term as it is a legal term which does not really apply to birds, but it refers to the situation when a mated pair of ospreys are still alive and well, but split up and mate with other partners at other nests. It almost always follows a failed breeding season. My earliest observation of extra pair copulation, which led to the published paper, was seeing a female copulating with a different male than her long term mate for at least a week, but then she returned to her old mate and nest to lay her eggs. He was probably seen as a good provider in a better territory. When the chicks were all predated that year, she left him the following year and mated with the "boyfriend" of the previous year. I have observed several males and females this year who are on different nests, with different mates, than they were last year. In all cases, their nests failed last year. 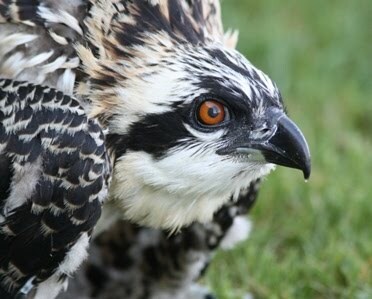 Not all ospreys split after a failed season however. The flip side is that producing chicks successfully together creates a bond with the partner and the nest...but extra pair copulations still occurr when the opportunity arises! I co authored a paper that included some of this research that was published in 2008 in the Journal of Raptor Research. As our population of Ospreys has increased, I am seeing more extra pair copulations and divorces. Hard for me to understand why anyone still believes they are monogamous! But it takes long term study, good field work, with banded birds to prove these behaviors. I am certain it occurs more than we think among unbanded birds. Interesting day in the field. I checked a bunch of nests and read a bunch of bands. I visited one of WU's nests, the male who tended two territories last year. The new male, who was displaced from WU's other nest, is still there and he was strongly defending the territory. He stood very close to the female as another male buzzed the nest (perhaps WU?). He even mounted the female at one point as if to say"she is mine", tho they did not copulate. He also chased the other male aggressively and returned to stand wing to wing with the female. It certainly looks like WU is no longer the territorial male there. It's interesting because this is the nest that was originally WU's primary nest, where he nested successfully prior to the polygyny. The other nest may have some attributes which makes it a superior site, in the eyes of an osprey. It is higher, on a transmission tower, which makes it safer from predators. It also removes the birds further from human activity. It is literally overlooking the Mississippi river. A series of males have tried to take over this nest in past years, so it is a very attractive site to an osprey. I am seeing extra ospreys at many nests now, in fact most nests! Lots of territorial disputes....sometimes 4or5 extra ospreys. I also got to see a favorite pair of mine whose nest had failed last year and they just totally disappeared. I was happy to see them again, both alive and together. Also found another of my favorite pairs have laid eggs! Chicks are on the way. So there are quite a few birds on eggs now. Don't ask me why some of these ospreys are my favorites. Some of it has to do with unusual events that I have observed, some of it has to do with the relationship between the two birds, some of it really unexplainable. I have just enjoyed my time observing them. Some of it is related to how long I have known particular birds...some I have not known long, but somehow they have captivated me. A mystery. I have gotten SO far behind here...it always happens this time of year. So much time spent in the field, gathering the data, that the correspondence and the posting here falls by the wayside. Where do I begin...first of all the male who was tending two nests last year did show up at the west nest and displaced the other young male seen there earlier. I have seen two different males (one of them young male mentioned above) at his east nest, but have not yet seen him there. I am only there about once a week tho...but he is incubating with the female at the west nest. No eggs at the other. (A handful of nests in the metro are incubating now.) I can also happily report that our two oldest males have returned! 22 and 21 years old. Our beloved female in Edina has not returned, and we will miss her after watching her produce 20 chicks in 8 years. There are a number of banded birds who have not returned and I wish I knew what happened to them. Many of you are aware of the demolition going on at the old Arsenal plant. Many osprey nests were removed over the winter and five new nesting platforms were placed in various locations to accommodate the birds. (I was not involved with this). Ironically, only one nest pole is being used! Four other pairs have decided to rebuild on power poles still standing on the property. Ospreys want to be where Ospreys want to be! There is a lot to be learned here about osprey behavior and management. I am still working hard at reading bands, and documenting the movement of birds from nest to nest. Special thanks to all the new volunteers!!!! I can't do this without a lot of help! I appreciate all of you! Keep your eyes open for new nests popping up on cell towers, ballfield lights, power poles, transmission towers etc! Good morning ...after checking nests all day yesterday I was too tired to post last night. I visited 24 nests, read twelve bands and have driven over 400 miles this past week. We do have a serious game of musical nests going on...ospreys identified on different nests than where they have been in the past. Doesn't mean they will stay there! I have been dismayed to see at least three nests removed from cell towers over the winter. The Ospreys can rebuild them in a heartbeat tho and they are determined! I am also seeing a number of new, young birds who are nesting for the first time. This is also a plea for help...several of my volunteers are unable to check nests due to health issues so I do need help watching over all these nests. If you would like to get involved, watch a nest or two or three, learn about osprey behavior, spend time in the field with me, please send me a message. It takes a village! What an interesting day in the field! Seeing old friends,(people and birds), observing behaviors and documenting the big game of musical nests! I visited ten nests, but had to go back and forth between them to figure things out, and it took me some time to read five bands. Three of those nests were still empty. Three of them had only one bird, and four of them had pairs present. Funniest part was seeing a male who I have not seen in about 7 years or so! He is 12 years old and showed up at a nest where the male disappeared last year and is presumed dead. Where has he been all this time??? AND he was with a female from another nest that failed last year...while her old mate is waiting alone for her. They seem to be taking over a nest...I wonder how this one will end. Jeeezzzz, it's so interesting. I also received several more emails with excited reports of birds back on their nests. So many nests to visit, and so many bands to read. Time is an issue...never enough. My first full day in the field checking nests...some interesting observations. Overall, I visited 22 nests and found five nests with ospreys. There were a pair of birds on three nests and one bird on two nests. I saw extra ospreys flying around at two of those sites. I read three bands. Most lakes near the nests were still frozen. Many of you remember the saga last year of one male who was attending two nests, with three chicks in each. Today one of those nests had a new male. He was copulating with the female there tho I was unable to determine conclusively if she was the same female as last year. It remains to be seen what happens if the territorial male returns. He may chase off this new male. I believe they sort of instinctively defend territories where they successfully reproduced. The female may have a say in the matter also as she might jump into the fray and help chase off the very male she has been copulating with, or she may stay out of it and let the males duke it out. Usually a territorial male can easily displace any other males who might try to take over. His other nest was empty. Perhaps one of the females won't return. Perhaps that will solve the dilemma. Perhaps he won't return! There are many scenarios possible. I have seen males defend two nest sites even if they were only breeding at one...defending the other one against any other ospreys, only to use it as a perch. Ah the drama goes on. Still so much to learn!